biology 101, biology and behavior, biology matters, different peoples is different (duh! ), dysgenics, iq, michael woodley, sir francis galton, tl;dr, what's this hbd business all about anyway? first of all, thanks to michael woodley, jan te nijenhuis, and raegan murphy for their response to my (here and here) and scott alexander’s comments on their recent iq paper (Were the Victorians cleverer than us?). thanks, too, to dr. james thompson for hosting their response! 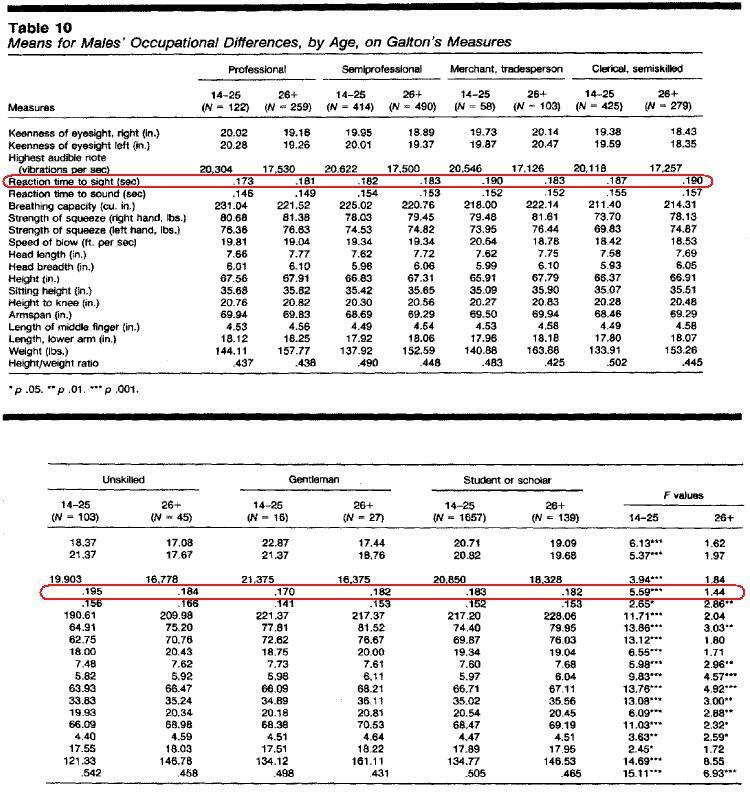 just to refresh everybody’s memory, woodley et al., concluded from their recent research that 1) iqs have decreased in the western world 14.1 points since the victorian period (1889), and 2) that this decrease is due to dysgenics. scott alexander and i both questioned the sampling techniques used in various of the studies looked at by woodley and co. — both in the victorian period and in the modern (see our previous posts linked to above for details). what is at issue here is whether or not woodley et al. have looked at the same sort of population at both ends of their research. if they’re trying to figure out whether or not iqs have decreased over time in the western world, then the subjects sampled in the past and in the present need to be representative of the two populations, and the two populations need to be of the same sort. unless i’m very much mistaken, sampling issues are considered to be of extreme importance in scientific endeavors (i.e. to get your sampling right). it also simply makes logical sense. so, we need to know a few things: 1) were the samples taken in the victorian period representative of victorians, 2) were the samples taken in modern times representative of modern populations, and 3) are all of these samples from like populations? 1) were the samples taken in the victorian period representative of victorians? galton’s sample consisted of museum visitors who had paid to take galton’s test (and, in some amount of cases, had probably paid to enter the museum as well). scott alexander superbly analyzed this sample further by combing through the info in johnson et al.’s “Galton’s data a century later.” scott found that galton’s sample was not representative of victorian brits — in fact, it leans heavily towards the middle- and upper-classes. this is not surprising when you think about who, in those days, would’ve been able to afford the costs of taking the test and possibly the museum fee as well. “Tables 10 and 11 turn out to be a gold mine – I worried the records of exactly who took the tests would be lost, but as you might expect of someone who basically invented statistics single-handedly and then beat Darwin in a debate about evolution as an encore, Galton was *very good* at keeping careful data. so galton’s sample is not representative of the victorian british population — it was unbalanced in that it did not include enough subjects from the lower classes. furthermore, the subjects in galton’s study self-selected themselves. these were individuals who, first of all, chose to go to the south kensington museum (now the victoria and albert museum) to start with (except maybe for the “students and scholars”), AND then they further chose to take galton’s funny little test. this is NOT a good sampling technique. if gallup or pew were to use such a technique, they’d be laughed out of the polling business. modern studies, of course, try to make sure that data from a representative sample of a population are gathered, otherwise your data might be skewed. which is exactly what scott found with regard to galton’s data. i mean, imagine what sort of person from the lower classes in victorian england first bothered to go to the south kensington museum AND then was interested in taking galton’s test. knowing what i know about the working classes (and i come right out of that class — more like the peasant class, in fact), those that want to go to a boring museum are the exceptions to the rule. i’m not going to look through all of these studies to check for sampling irregularities because, again, it’s not my research, so it’s not my job. but let’s take a quick look at the first one i highlighted above: seashore et al. 1941. i don’t have access to this paper either, and, no, i’m not gonna pay for it, so i’ll have to assume going by another of r.h. seashore’s papers that these rt data were drawn from american students (possibly northwestern university where seashore worked — correct me if i’m wrong), and going by the publication date (1941) that the samples were collected in the 1930s or 1940-41.
woodley et al. say that, in comparing the nineteenth century vs. 1940s-era students, there is a +16.8ms (183.2-200 ms respectively) difference between the two groups, and thus a decrease in average iq from the victorian period to the 1940s. my question is: what makes silverman, or woodley et al., confident that the samples from an american university in the 1930s-40s are comparable to thompson’s university of chicago samples or galton’s samples from the 1800s? as shown above, both of those victorian studies were done on elite victorian groups, while, on the other hand, it is well know that already by the 1940s at least, the “college bubble” had started in the u.s. in which nearly anybody is admitted to university. when the average college grad shifts over time from having been drawn from the upper classes to the middle and even the lower, it’s not surprising that their average iqs drop! 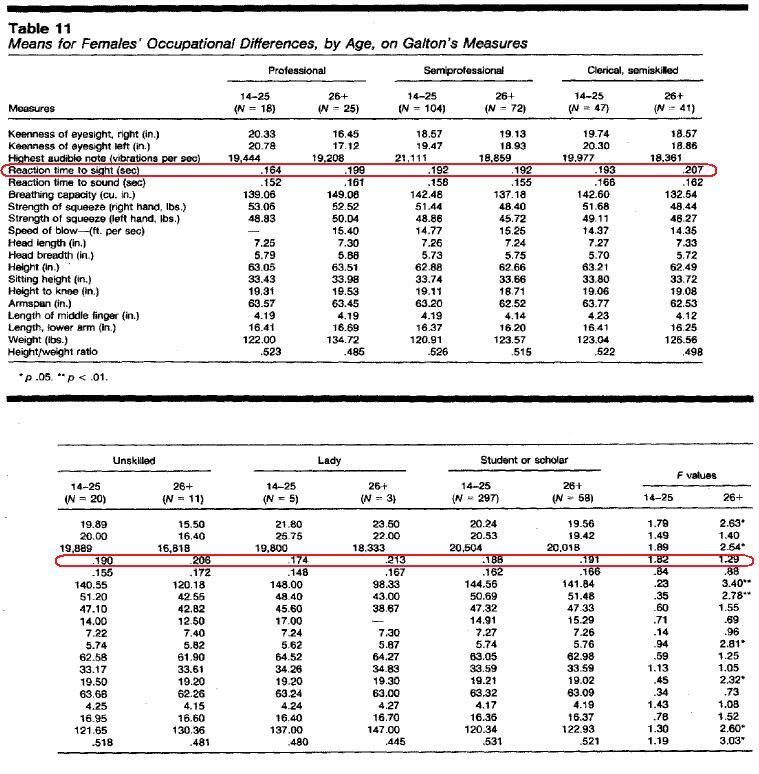 even within galton’s self-selected group of male museum goers (see table 10 above), rts (iq) varied between the classes, with the upper classes having lower rts (indicative of higher iqs): ages 14-26: gentleman=.170, professional=.173, semiprofessional=.182, merchant/tradesperson=.190, clerical/semiskilled=.187, unskilled=.195. why, then, shouldn’t rts/iqs vary between college students of the late-1800s vs. the 1940s when more middle- and lower-class individuals attended college in the 1940s than in the late-1800s? as for the second study i’ve highlighted above — anger et al. (1993) — which included “a combined male + female sample of 220 postal, hospital and insurance workers from three different US cities….” postal workers? seriously? comparing 1990s american postal workers to galton’s middle- and upper-class museum goers? really? 2) were the samples taken in modern times representative of modern populations? some of the studies used by woodley et al. are probably better (i.e. more representative of modern populations) than others. as i pointed out in my first post on this study, i would imagine, although i haven’t actually checked it, that the sampling in the 1984–85 U.K. Health and Lifestyle Survey is probably fine, and so the rts representative of the whole of britiain. on the other hand, the 2002 study from the university of bristol may have included at least 10% minority individuals if not more in the study. since only ca. 8% of the u.k.’s population in 2001 was non-white, this bristol study may not have been representative of the nation’s population. hard to know without knowing the demographics of who was included in the study. 3) are all of these samples from like populations? the victorian samples were drawn from mainly the middle- and upper-classes, not to mention a large group of self-selected individuals who were specifically interested in taking part in such a study, while the more modern studies have included greater numbers of middle- and lower-class individuals as well as a certain percentage of non-whites. so, again, i think that there are quite a few sampling issues in this study, and that the presence of these means that the researchers’ findings are not as reliable as they think that they are. could there have been a decline in western iqs since the victorian period due to dysgenic factors? of course. does the fact that there are sampling issues in the woodley et al. (and silverman, for that matter) paper prove that there hasn’t been a drop in iq since the victorian period? no. obviously not. again, like i said before, this is a really neat study from woodley et al.! i hope they continue investigating along these lines, because it would obviously be important to know if average iqs are declining in the western world. p.s. – before bruce charlton shows up and gets all inquisitional on me (repent, or be damned to hellfire for eternity! ), yes, i ALWAYS get all picky about sampling (see here and here and here and here for just a few examples). if you don’t get the fundamentals right, everything else will inevitably be wrong! they point to a study by silverman — Simple reaction time: It is not what it used to be — which i haven’t seen, because i don’t have access to it (and i’m too cheap to pay for it (~_^) ). they’ll probably be trying to figure out what the “h.b.d.” stands for … hermione boudica daenerys…? the blogger known as neuroskeptic actually had an academic paper published under his pseudonym, so yes … the times they are a’ changin’! Very well – lets re-weight the male data (bigger N’s) in Johnson et al. (1985) based on these numbers. Unskilled laborers = 75%, Professionals = 3%, all other groups get 4.4% on the basis that I don’t know their actual representations within the Victorian populace (maybe somebody could find these data? I would be happy to re-conduct this analysis). This raises the Victorian mean for males to 191.6 ms (as opposed to 183 for the males in our study). Incidentally our meta-regression weighted mean for 1889 (the start point of our analysis) was 194.06 ms – looks like we were about spot on. Bristol is one of the most highly selective universities in the UK and is a globally competitive institution. I would argue that they were certainly comparable to Thompson’s Chicago students from the 1890’s both ethnically and in terms of SES (privately educated upper middle-class students accounted for around half of its student body in the 1990’s and 2000’s – it actually took the highest proportion of these students after Oxbridge). Am I to take it therefore that you cede to us that the ethnic heterogeneity issue is simply not an issue? We did after all show that the simple RT means for exclusively White samples were comparable to the N-weighted aggregate of our modern samples. I notice that this elicited no commentary. In fact we cited data from two papers showing this. This is a very significative finding, one that should drive a lot of research for confirmation, identifying underlying causes, and try to fix those cause(s). That being said, Like HBD Chick and others, I have trouble believing such a large change comes from genetic evolution alone, given the number of generation involved, and the fact that the driver is supposed a decrease in selective pressure for intelligence (or short reaction time), not a pressure for low IQ/ high RT (which would have to be huge, and I fail to see how it could be even slightly positive reproductively). To explain such a large change, I feel we must have multiple causes acting in the same direction. So yes, self-selection bias comes to mind (museum goers are not average, and people paying to check their RT are not average either). And you also have environment effect. People have grown on average since Victorian era, quite a lot (maybe 1 SD, he he coincidence?). Dunno if there is a correlation between height and RT. And then there way be the disgenic change…. oups, “And then there may be the disgenic change….”. I had a look on Psychological Comments, the measurement apparatus are briefly described in a previous post. Indeed, they are quite different, and I suspect that beside the accuracy discussed extensively, there may be a problem with the zero definition for the mechanical or electromechanical devices. For an electonic timer, it is easy: electric signal start both the timer and the visual clue (but there is indeed the heat up time for filament lamps :-( ), a button press send a electric signal to stop the timer. signal propagation time is negligeable, so time measured is visual signal appearance (filament heating, …) + RT + button depression time. I suspect total time is reported as RT, so a slight overestimation. For mechanical device, there is more inertia in the apparatus, so experimenters naturally will be more careful: there may be a calibration step for which the lever showing the disk and the lever stopping the pendulum are physically coupled, the the pendulum drop is measured in those condition. It will probably not be exactly zero (inertia of the levers and clutching system), but repeatable and considered zero RT. So yes, I believe the different in measurement devices can have an effect. great. but you still haven’t dealt with the “self-sorting” problem. galton just didn’t have an unbiased, representative sample of victorian brits. the thing to do, i would think, would just be to have an equally unbiased, unrepresentative sample of modern day brits — white brits, obviously. compare like with like. victorian clerks were largely number crunchers — they were the “calculators” of the day. and they were middle class (as, i presume, were galton’s other semiprofessionals). they cannot be compared with late twentieth century american postal workers, a majority of whom are barely literate. anger’s hospital and insurance workers might be comparable to galton’s clerical workers, but not the postal workers. you need to factor them out. and the question of the postal workers brings me back to the race/ethnicity question. where were the data on postal workers that anger used collected? 20% of u.s. postal workers are african-americans, but in a major city, that number can jump to 75 or 80%. so, again, depending on where those data were collected, you could wind up with a skewed data set (because you’re not comparing like with like). well, i’m sorry, but you’re simply incorrect about the ethnicity side of it. in my first post, i linked to bristol university’s own webpage which breaks down the demographics of their student body by year. here it is again. in 2001-02, 10.59% of the student body was non-white, and another 17.88% was unknown, so it might’ve been that up to ca. 27% — or one-fourth — of bristol university students in those years was non-white. there’s no way that one-fourth — or even one in ten — students at the university of chicago in the 1890s was non-white. absolutely no way. 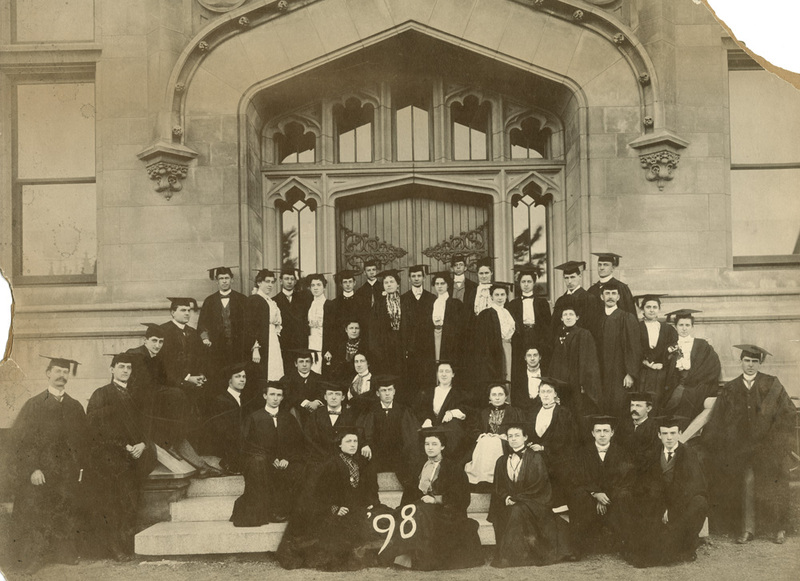 here’s the univ of chicago class of 1898 (taken from here). i don’t spot a single brown face (although quite a lot of women!). and, again, like i said in my original post, we don’t even know what the composition of the bristol univ sample was. was it representative of the entire bristol univ student body? we have no idea. and it was a very small study — n=24. really, i think you should just throw this study out because there are so many uncertainties surrounding it. one of the best studies you’ve got (and i didn’t go through them all, so there might be others) must be the ’84-’85 health and lifestyle study because 1) i’m guessing they tried real hard to get a representative sample, and 2) they asked about — or recorded — ethnicity, so you could just take out all the non-white samples! and presumably you could also sort by ses, so you could get at a sample that directly matches galton’s! edit: you should also take out any non-british whites, like irish and italian, for example. presumably not many individuals from those groups were included in galton’s study, either. no, obviously it remains an issue since you need to be comparing like groups if you want to get at an accurate measurement of how much western iqs have decreased since the victorian era (if they have … which they might’ve!). you need to know if your modern samples are 10% non-white or 80% non-white, ’cause both of those would make a difference, the latter a greater difference obviously. i didn’t bother addressing this because i don’t see why it should be necessary to have to justify the inclusion of unlike data sets in a study when the simpler, and more scientific, route would just be to use like data sets in the first place. i agree! more research should be done on this issue. it’s a fascinating and important one, and we need to know more. kudos to woodley et al., and other researchers (silverman), for looking into it and bringing it to everyone’s attention! i haven’t had a chance to follow those discussions. thanks for your summary! no need to apologize. i never said/meant/thought otherwise! Belated thanks for writing this great blog! Yeah, seriously, postal workers. In Chicago they are only “the best” of “the best”. Cough cough. heh! (^_^) cool. i’ll come over and have a look! Why are you assuming nonwhite students of bristol university have low iq.It is not easy to gain entrances into elite universites. We have Raven’s Progressive Matrices data for Victorian Brits from roughly the same birth cohort (birth year =1877). Compared on current norms their IQs would be below 70. The difference between this data and the reaction time data could hardly be more different. So, if the Raven’s data is totally contaminated by cultural exposures, and the reaction time data is uncontaminated, doesn’t this suggest that Francis Galton constructed a far superior measure of intelligence in the 19th century, and that psychologists have been on a massive wrong detour for over 120 years now? A prediction for the dysgenic reaction-time viewpoint, it would seem, should be that old people will score much higher on reaction time measures than young people, even as they score much lower on IQ tests. Perhaps they don’t and the explanation is that RT intelligence (unlike IQ intelligence) declines with age. Well then any longitudinal data on RTs will still give us some sort of obvious formula for predicting their younger RT scores. Birth cohort comparisons across the age spectrum have the power to strongly confirm or disconfirm this hypothesis. HBD chick, as I said, my response will be short since there is no much to say, given Woodley’s replies. But I want to clarify something nevertheless. Taking this into account, Woodley found that the number is not different from what is displayed in their original paper. Therefore the fact that “galton just didn’t have an unbiased, representative sample of victorian brits” doesn’t affect Woodley’s conclusion that the victorians were more intelligent. Your critique is invalid. It is unhelpful to continue to point out that Galton’s sample is different or whatever, if the found result is unaffected by such corrections. Does that sound correct to you ? Of course, those numbers are fictitious. But what I mean is that the effect of ethnic pool must be small. Clearly. Finally, with regard to this comment “you should also take out any non-british whites, like irish and italian, for example” I don’t find it convincing. If you remember, Lynn said (here) that in the US, the IQs of white sub-groups (italian, french, germans…) are not significantly different from each other. “Chuck” asks me recently to replicate that, using NLSY79 and NLSY97. I found more or less the same result, that is, a very small difference between those groups, around 1, 2 or 3 points, as a maximum depending on the groups being compared. So, unless south-europeans are drawn from a very different pool in the UK, I wouldn’t expect it to affect the result as you suggest it would. Maybe the only thing I tend to agree with and concede is about Greg Cochran comment and perhaps as you said too, “such a severe drop in genotypic iqs could not have happened in such a relatively short space of time without some really severe selection pressures” and I am not aware of that. But well I haven’t thought about it deeply. Take it for what it worths. It seems that I am very tired those days. Forget what I said. It’s obvious that 100 – 87.3 doesn’t equal 2.7.
say i’m gallup, and i want to find out what the american public’s opinion on gay marriage is — the average opinion. what i don’t want to do is to go to a gay bar in san francisco and leave flyers down asking for anyone who’s interested in responding to my survey to please give me a call. if i DO that, i’ll have a self-sorted group of people as my sample — i’ll have a group of gay people who might be particularly interested in the topic of gay marriage, and likely particularly biased in favor of it — AND i’ll probably have a bunch of gay folks who are REALLY interested in the topic, ’cause they’re the ones who bothered to pick up the phone and call me or email me or whatever. galton’s sample of victorians included ONLY people who BOTHERED to go to the south kensington museum in the first place (some of whom paid admission, depending on what day they went), AND, furthermore, ONLY people who were INTERESTED in taking galton’s test AND forked over the money to take it. in other words, they were a self-sorted group of people. NOT RANDOMLY SAMPLED! no. what i’ve been saying is that in some of the modern studies, we DON’T KNOW what the breakdown of ethnicity was. in the bristol university sample, for instance — we KNOW that at least 10% of the student body was comprised of minorties — maybe a lot more. HOWEVER, did the sample in this study reflect that breakdown or not? could there have been MORE minorities in the sample than were present in the student body? could they have all been filipino or pakistani nursing students? or were they all w.e.i.r.d. students? the point is: WE DON’T KNOW. again, the 1984-85 health and lifestyle study would be a good one to delve into because they RECORDED ETHNICITY and presumably ses. one could control for those things. see my most recent post on this. southern italians and southern spaniards in europe today have much lower iqs/pisa scores than their northern counterparts — and much lower than italians in the u.s. some of these people could easily be living in england today (in fact, i know some of ’em). why not just factor them out in order to have the same sort of ethnic sample as galton anyway? what is so hard about that? i don’t get what the objection is. i mean, if i wanted to compare the behavioral patterns of squirrels in the u.k. to see if those patterns had changed from, say, a study done in the eighteenth century, i’d make sure NOT to include any gray squirrels in my study today, since there were no gray squirrels in the u.k. in the 1700s. if i did, the comparison would not be a valid one. Trust me, I understand what you say, and your paragraphs below as well. But that’s not exactly what I meant. I know there is a problem regarding the sampling. Woodley knows that too but he says that it doesn’t affect their results and therefore their conclusion. In other words, the relevant question here is : do you think that the sampling problem would reject Woodley et al’s conclusion about the sharp decline in IQ as assessed by reaction time tests if correction for this artifact doesn’t affect their actual numbers ? Sampling issue is irrelevant if no one bothered to answer that question. One IQ point decrease or change due to ethnic composition doesn’t appear to be huge. Even though those figures are fictitious, the relevant point is that you need to do the math if you want to know approximately what would be the impact of changes in ethnic composition given x or y percentages of non-whites, and so on. Next, you said that southern italians average lower IQs than northern italians. I have read something like that before, of course. But my last message dealt about the mean IQ of italian people as a whole. Even so, I don’t believe that the number of southern italians or other southern-europeans with low IQs is so huge as to completely bias the actual results. Tell me if a sentence or another is poorly phrased. My english is far from being perfect. re-weighting the different professional groups within galton’s sample (as michael did) doesn’t get rid of the problem that the entire sample is self-selected (i.e. not random). no, i didn’t. i’m saying that you misunderstood my original message about the presence of different ethnicities in the modern samples. (^_^) …and that is that, in several of the studies (like the bristol univ one), we don’t know how many non-britons were included. I think I responded to this dispute but I may have done so on another blog – maybe not the best technique. So I’ll repeat myself. Galton gave each participant a card with his or her measurements on it. He kept a duplicate for his own records. Each card had the name of the test subject at the top. Galton had followed up on his biographies of imminent men with a similar set of biographies of ordinary men. There’s an excellent possibility that that there are complete biographical narratives on many of the same people who got measured. Galton was obsessive about record keeping and the measurements were probably taken of his neighbors. The laboratory was only a few blocks from his home. So there is a very real possibility that with a little digging you could find out quite a bit about his test subjects. I’m not volunteering but someone could go through Galton’s books, the cards, and records of his neighbors. For anyone else you wouldn’t get very far working on test results from more than a century ago. But Galton was a different sort. He kept records. I have come to this discussion very belatedly, having seen a reference to it in another blog. I just want to point out that Francis Galton himself never claimed that his ‘experimental subjects’ were representative of the British population of his day. In the very first paragraph of his very first paper on the work of his Anthropometric Laboratory, he said ‘The value of the results obtained at the laboratory may be questioned on the ground that the persons who applied to be measured were not random specimens of the crowd who attended the Exhibition, and that the latter themselves were no fair sample of the British population, nor of any well defined section of it. I have no reply to make to this objection, except that it should not be pushed unreasonably far.’ [J. Anthrop. Inst. 14, 1885, 275-87. Facsimile available at Galton.org.] Galton went on to point out that the data could still be useful for comparisons *within* the sample, e.g. between different occupations. But I think he would have been very surprised – if not alarmed – to see his data on reaction time being used over a century later as a crucial piece of evidence on any important issue. Incidentally, I don’t think he ever published any data on reaction times himself (they have all been extracted comparatively recently from his raw record sheets) and we cannot know what explanations or qualifications he would have attached to them. For example, a question has been raised whether he took several measurements of each subject, and if so whether he used a mean value, a ‘best of three’, or whatever. If he had published the data himself, he might well have clarified this. oh! thanks very much david! It’s related both to changes in the composition of milk consumed and reduced consumption of milk without an alternative source of iodine. I don’t think anyone did until three years ago. It would explain a few things if true. In the original paper the authors seem to suggest that there’s this kind of dysgenic effect that came out because in general the standard of living increased, but it seems a bridge too far to implicitly assume that higher status individuals, who were more likely to survive according to the authors, were of higher IQ. What is the basis of this connexion between status and IQ? At least at first blush one would assume higher status classes would be a haven for low IQ phenotypes as wealth would provide an advantage that lower status individuals would not have. Lower IQ phenotypes could persevere in classes where wealth and political power were inherited, because a high status individual would have to work, in general less, than a lower status one to stay alive.